The global genetic testing services market is expanding with the increasing incidence of cancer and rare as well as autoimmune diseases. 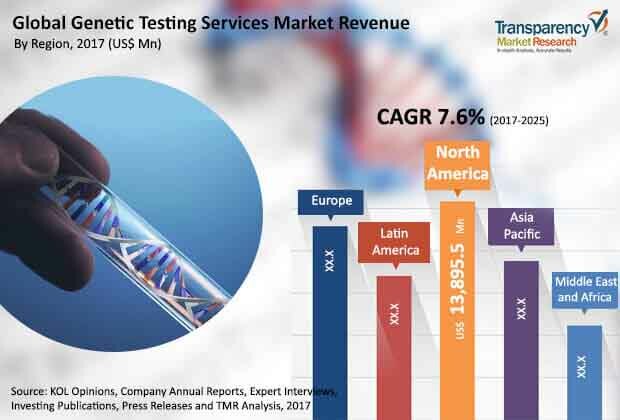 The global genetic testing services market was valued at US$ 33,500.0 Mn in 2016 and is projected to register a compounded annual growth rate (CAGR) of over 7.6% from 2017 to 2025, to reach value of US$ 64,131.0 Mn by 2025. The global market is witnessing relatively high growth, owing to increase in awareness among people, adoption of genetic testing by physicians and patients, and rise in the prevalence of chronic diseases across the globe. Genetic test is a type of medical test which analyzes the changes in chromosomes, proteins, or genes, which may be caused by any suspected genetic condition or disease. Genetic testing is also performed on tumors to diagnose cancer and plan the treatment. Several genetic tests are used currently. The key types of genetic testing are newborn screening, prenatal testing, pre-implantation testing, carrier testing, etc. Several methods such as molecular method, chromosomal method, and biochemical method can be used for genetic testing. Genetic testing is employed to identify the risk factors, to screen the newborns, and also in forensics. The global genetic testing services market is witnessing significant growth and is expected to expand at a robust CAGR during the forecast period. Rise in the adoption of health care IT solutions for genetic testing, increase in the prevalence of cancer and cardiovascular diseases, and benefits offered by genetic testing (such as specificity and early identification) are expected to have a positive impact on the global genetic testing services market during the forecast period. Furthermore, rising awareness about genetic services and increasing incidence of common autoimmune diseases are likely to propel the global genetic testing services market during the forecast period. Lack of awareness about genetic services in several developing regions and high cost of genetic tests in several countries are a few of the factors restricting the global genetic testing services market. The global genetic testing services market has been segmented based on test type, service provider, application, and geography. Based on test type, the market has been segmented into prenatal testing, newborn screening, predictive & presymptomatic testing, pharmacogenomic testing, and others. Among these, the predictive & presymptomatic testing segment held a major market share, in terms of revenue, in 2016. Increase in awareness about diseases such as cancer and early detection of diseases are some of the factors fueling the segment. Based on service provider, the global genetic testing services market has been classified into hospital-based laboratories, diagnostics laboratories, specialty clinics, and others. The hospital-based laboratories segment held the largest share of the market in 2016, in terms of revenue, followed by the diagnostic laboratories segment. User convenience and increasing number of hospitals are a few factors projected to propel the hospital-based laboratories segment during the forecast period. Based on application, the global genetic testing services market has been divided into oncology, infectious diseases, autoimmune diseases, and others. The oncology segment is anticipated to dominate the market during the forecast period, due to high prevalence of cancer across the world. Geographically, North America dominates the global genetic testing services market, followed by Europe. Developed countries such the U.K., the U.S., and Germany witness more awareness about genetic testing. Furthermore, developed infrastructure, increase in health care investments, and robust R&D activities in these countries are driving the market in these countries. The market in the Asia Pacific region is expanding rapidly. Developed countries in the region such as Australia and Japan are offering growth opportunities to the genetic testing services market. India and China are potential markets for genetic services, due to increase in the prevalence of infectious diseases in these countries. Some of the key players operating in the global genetic testing services market are Laboratory Corporation of America Holdings, Quest Diagnostics Incorporated, Genomic Health, Inc., NeoGenomics Laboratories, Inc., Eurofins Scientific, Ambry Genetics, Hoffmann-La Roche Ltd, Illumina, Inc., CENTOGENE AG, and 23andMe, Inc. The research is a combination of primary and secondary research. Primary research represents a bulk of our research efforts along with the information collected from telephonic interviews and interactions via e-mails. Secondary research involves the study of company websites, annual reports, press releases, stock analysis presentations, and various international and national databases. The report provides market size in terms of US$ Mn of each segment and sub-segment for the period from 2017 to 2025, considering the macro and micro environmental factors. Growth rates of each segment of the global genetic testing services market have been determined after a thorough analysis of past trends, demographics, future trends, technological developments, and regulatory requirements. A detailed qualitative analysis of factors responsible for driving and restraining the market and future opportunities has been provided in the market overview section. This section of the report also includes market attractiveness analysis that provides a thorough analysis of the overall competition scenario in the global genetic testing services market. Market revenue in terms of US$ Mn for the period between 2015 and 2025 and the compounded annual growth rate (CAGR %) for the period from 2017 to 2025 have been provided for all segments, considering 2016 as the base year. Market size estimations involve in-depth study of features of different types of genetic testing services. Additionally, market-related factors such as rise in the prevalence of chronic diseases, projected launch of new tests in various geographies, and historical year-on-year growth have been taken into consideration while estimating the market size. Genetic testing is a type of medical test which analyzes the changes in chromosomes, proteins, or genes, which may be caused due to any suspected genetic condition or disease. Genetic testing is also performed on tumors to diagnose cancer and plan the treatment. Based on type, the genetic testing services market has been segmented into prenatal testing, newborn screening, predictive & presymptomatic testing, pharmacogenomic testing, and others. The predictive & presymptomatic testing segment is anticipated to hold a significant share of the global market during the forecast period. Based on service provider, the genetic testing services market has been classified into hospital-based laboratories, diagnostic laboratories, specialty clinics, and others. The hospital-based laboratories segment is anticipated to dominate the market during the forecast period. Based on application, the genetic testing services market has been divided into oncology, infectious diseases, autoimmune diseases, and others. The oncology segment held a major share of the market in 2016. Geographically, the global genetic testing services has been segmented into five regions: North America, Europe, Asia Pacific, Latin America, and Middle East & Africa. Every region has been further segmented into major countries in the respective region.. The report also profiles major players operating in the global genetic testing services market, based on various attributes such as company overview, financial overview, SWOT analysis, key business strategies, product portfolio, and recent developments. Key companies profiled in the report are Laboratory Corporation of America Holdings, Quest Diagnostics Incorporated, Genomic Health, Inc., NeoGenomics Laboratories, Inc., Eurofins Scientific, Ambry Genetics, Hoffmann-La Roche Ltd, Illumina, Inc., CENTOGENE AG, and 23andMe, Inc.